I have been doing this for fun and for friends now on and off for over a year. Spent a lot of money, watched a lot of videos, and have reached out to a lot of great folks on here. 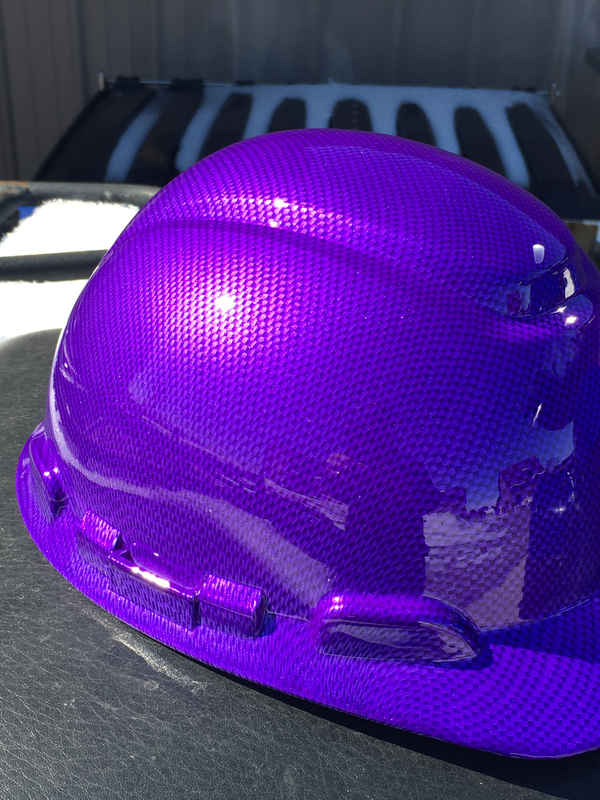 I dipped a hard hat last night feeling good about myself and it was a total fail!!! Epic failure! So this morning I scuffed and rebased it and decided one way or another I was going to beat this! Set my activator gun up again, kind of a mix between K2’s video and Jason’s from OHW. I struggle reading film. Period. Everything I thought was over activated I would come to this forum and check pictures and posts and found out that I was pretty much always under activated. I used DTP base and Kansas Purple carbon fiber as well as K2 Superbrew out of a Devilbiss GFG-670 plus. What looks like dots are just the pearl in the sun. There was no spots in the dip. Thanks again to everyone on this forum. Yep flame treated first. I cannot tell you guys how much I appreciate all the advice and help you all give! I was so happy with this hit after last nights epic failures. But again couldn’t have got to this point without all of the help of this forum! There are some sags due to bad gun set up for clear but I can fix that with some elbow grease and a flow coat later. Just happy with the hit. Thanks guys I was real proud of this one. Thanks bro!! We have a bunch of Candy Concentrate from our Spectra Chrome system and adding a bit of that to some clear was fun to do. Then hit it with OHW clear over it all and I really liked the final result! !